Last week, Los Angeles-based MOVIECLIPS.COM (www.movieclips.com) announced the firm's Series A funding round, worth $3M, from Shasta Ventures, First Round Capital, and a number of Silicon Valley angels. We caught up with Zach James and Rich Raddon, co-founders of MOVIECLIPS, to learn more about the company and also hear about the firm's funding round. Zach--who is the brother of Omniture founder Josh James--has served at Credit Suisse and Hummer Winblad, and Rich previously ran the Los Angeles Film Festival. 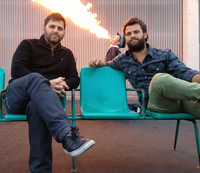 (Photo: Rich Raddon on left, Zach James on right, courtesy MOVIECLIPS.com). Thanks for the time today. First of all, what is MOVIECLIPS.COM about? Zach James: MOVIECLIPS is the largest and only collection of movie clips, licensed from the studios. We said to the studios--you have this amazing content, why not let us clip it all up, find the best moments in film, and allow users to post those to their blogs and Facebook pages, and let us create curated channels on the web? How is this different than the movie clips floating around the web now? Rich Raddon: The reason we are differentiated from other people who have assembled lots of movie assets on the web, is we've actually created the clips. What I mean by that, is many times, when marketing departments are releasing a film, they release a few teaser scenes. Those scenes are aimed at getting people to get to the theater. A few companies have aggregated all of that free media out there from those marketing materials. What we've done, on the other hand, is we've actually gone through the work of going through films, and finding the most memorable scenes from the movies -- the ones that people talk about. We did this to enable the movie conversation online, and because we knew that was the best way to do it. For example, you might look at the movie, the Matrix, and you'll see that the teaser scenes from their marketing department won't get you the scene where Morpheus says -- take the red one or the blue one. You just won't get those moments. You also won't get those moments from Jerry McGuire, where he says "Show me the money" and whatnot. That's what differentiates us from other people. What do you offer the studios, and why would they want to work with you to make those clips available? Rich Raddon: There are two things. Partially, it's the amount of piracy you get when you don't make that stuff legally available online. Studies show, if you don't, people will turn to piracy. It helped that we could speak to that problem, and help the studios address that issue by giving consumers a legal alternative. Secondly, it's a changing environment for studios, as they are looking for ways to maximize their assets. Especially with DVD sales declining, we offer an interesting way to help studios. Our metrics show that when people watch chips, they increase their tendency to want to watch that feature length film. Because things are moving toward streaming, and online, we become an interesting funnel to move people along the chain to actually consuming that media. We've seen the proliferation of streaming through Netflix, Amazon, and others, and as people get into the streaming features business, that income can help make up the income being lost in DVD sales. We often hear about lots of rights issues with dealing with studios, distributing to different countries, and so on--how do you address this? Rich Raddon: When Zach and I came together, I had been working in LA for fifteen years in entertainment and traditional media. I ran the Los Angeles Film Festival for a decade. So, before Zach and I started the company, we spent six months talking with constituents at the studios, and made sure things were possible. Indeed, there are lots of rules and regulations and restrictions, in addition to guild issues you have to be aware of. The difference here is, Zach and I took a year and a half to figure all of that out, so that when we went to the studios, we had the answers. We know what the restrictions are, and because of that, it gave the studios a lot of comfort. They saw we were highly educated in that space, and because of my background, knew we understand traditional media and were able to address their issues. Many times we heard back from studio partners, who said it was refreshing and interesting to see our combination of Silicon Valley experience and local experience, where we knew their industry and concerns. So often, they were being approached by people for partnerships, who just don't understand the culture and climate here in Los Angeles. Why don't you talk about your backgrounds? Zach James: I'm the Internet side of the company, I guess. In the early days all through college, I worked at Omniture, which was then an Internet startup. My brother co-founded and was CEO of the company, until he sold it to Adobe. From there, I did a couple of internships in the venture capital world, including with Hummer Winblad in San Francisco. I ended up taking a real job at Credit Suisse as an investment banker, where I spent time studying and finding hot new Internet companies that were in Silicon Valley at the time. One of the companies was YouTube, and was one of the deal which I worked on. We represented Google in the acquisition of YouTube. So, online video was right in my wheel house. The transition from banking to doing this was a good one, because I had some experience in it. Rich Raddon: I was born and raised in Chicago, and my first job was working for John Hughes as an assistant. I did that for a few years, and then went on to produce independent films for seven or eight year. For about nine years, I ran the Los Angeles Film Festival, which is an event in June put on by Film Independent, the largest independent film organization in the country. My background was totally in traditional media and studios. You've got dramatically different background, how did you find each other? Rich Raddon: Strangely enough, it was a random call. Zach's family lived in Chicago for a brief time--he was an army brat--and there was a military base near us where we lived. There were four families that became close. I'm the old man in the group, and Zach was in diapers when I was a teenager. Anyway, I was down here, thinking about this idea and talking to a few people, but I knew very little about the Internet culture. Literally, Zach ended up calling me via a mutual friend, because he was at CS First Boston thinking about moving down to LA. Zach James: I was looking to work more in the media area, and was looking at startups and opportunities in LA. I couple of times, I ran into people telling me I ought to talk to Rich Raddon. I said--I know that guy, my family knows that guy! So, I got his phone number from my family and called him up. Rich Raddon: It's a great story. We set up a meeting, which was almost cinematic. It happened that I was going to be up at Skywalker Ranch, in Marin County, North of San Francisco, because I did a lot of work with George Lucas. We spent a lot of time getting independent filmmakers up to the Skywalker Ranch. So I met Zach there, and we took a walk around Lake Ewok and talked about the idea. Fascinating story. How did you two manage to attract such high profile investors? It seems most venture investors have been very shy about investing in Hollywood content related ventures. Zach James: I think it was a couple of things. We had just come out of TechCrunch Disrupt, and we were starting to get the word out about our launch. We had gotten some good press from the New York Times, the Wall Street Journal, TechCrunch, Mashable, and NewTeeVee, and then when we went to TechCrunch Disrupt we placed in the top 5. Then, we got written up by Time Magazine as one of the Top 50 sites of 2010. There was just some good hype around us. I kept making the rounds of Silicon Valley, talking to VCs. When we met First Round, they just immediately understood what we were doing. When we talked to Shasta Venturse, they asked us a few questions, and the first one was--what do you think about the product? What do you feel about UI/UX? All of that was music to my ears. They were what we were looking for in talking with venture capitalists, because they were talking product, and looking to help us create an amazing product for our users. Every meeting I had with them, three meetings in a row, they kept wanting to talk about the product, which is very unusual for me to see from VCs I was meeting. So, we really liked Shasta, and continued to talk with them. In the end, it worked out, and we decided to do a combination of the two firms we liked best, First Round and Shasta Ventures, while still leaving room for some powerful angels we thought could be a significant to our deal. We came in talking to angels, saying that we had Shasta and First Round, and all we got were yeses, from Jeff Clavier, Ayden Senkut, Naval Ravikant and Nivi Babak of VentureHacks, and the others. We felt we had a perfect group of individuals around the table to contribute. Now that you have the funding in hand, what are you working on? Zach James: The first thing after we got the money, is we redesigned our site. It's all about distribution, and we're curating our content like crazy. We've been working to figure out the best moments from each movie, to create very single clip. We've done lots of work figuring out what are the best moments from each movie, and added thousands of tags to each clip. We've provided information like whether it's an action scene, what the props are, and so on, and also curated those into the best action scenes, the best romances, and other fun stuff like that. The main thing we're now doing with the money is helping to distribute that content on the web. We've signed great partners like AOL and many others, and have been figuring out how to give them the content in the best way, and what kind of unique partnership to create with each distributor. With AOL, we might give them clips and mashups and top ten lists, and with MSN we might do something a little bit different, which is more unique toward MSN. We're also making our feed completely available to any kind of web developers, whether that's a weather site, or a site selling knives--we're given them unique and cool clips, which will increase the time spent on their web sites, and help them to create a more premium experience. Finally, how does this all work out financially for the studios? Rich Raddon: It's an advertising based play, and we do a revenue split back to the studios. We haven't yet started rolling advertising, and are in our pre-revenue phase, but we hope to be implementing that sometime in Q1.